FORT WORTH — When Patrick LaCour arrived at Texas Christian University three and a half years ago, he wanted to find a place where he could play piano for Mass and grow in his faith. But the New Orleans native found so much more. For LaCour, some of the most meaningful times in his college years have come through activities with the ministry like the annual Awakening retreat. LaCour is a co-president of the group and Marchesseault is co-chair of the music committee. The two are among some 400 students involved in the ministry. 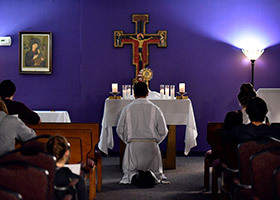 About 200 attend one of two weekly Masses on campus, around 80 go to an annual retreat, and dozens more go to social events and Bible studies. The group is thriving and growing said Tom Centarri, the ministry’s director for the past four years. 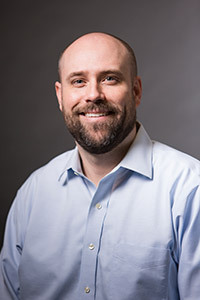 As of Feb. 1, he is becoming an insurance agent for Knights of Columbus in Arlington and handing the reins over to TCU grad and former seminarian Ed Hopkins. One of the hallmarks of Centarri’s time with the ministry has been his encouragement of student leadership. Thirty students now are actively leading committees and planning activities. “We want it to be student led and student driven,” he said. When Centarri began with the ministry, it had an assigned chaplain. But as of 2017, priests from around the diocese have celebrated Mass, heard confessions, and more. “It’s been difficult, but a blessing in disguise,” Centarri said. While many priests in the Diocese of Fort Worth have helped out, three are frequent contributors to the ministry: Father Hoa Nguyen of Holy Family Parish, Father John Shanahan of St. Andrew Parish, and Father Joseph Keating, pastor of Immaculate Heart of Mary Parish in Abbott and Nativity of the Blessed Virgin Mary Parish in Penelope. Ministry leaders were worried that the lack of a chaplain might result in less student involvement, but instead attendance is thriving and there has been a great side benefit. College students are helping out more at nearby Holy Family and St. Andrew, like assisting at youth group. “We’re definitely plugged into the community more,” LaCour said. Serving others is a priority for members of the campus ministry. Students have had play dates with refugee children through Catholic Charities and others have visited with senior citizens at a nearby assisted living center. A group has helped with cleaning and maintenance at St. Patrick Cathedral. Last summer, one student led a group to Puerto Rico to help rebuild homes damaged in the 2017 hurricane. Hopkins said he aims to continue the ministry’s focus on service, along with faith education and evangelism. “We definitely want to provide support for students, many of whom are away from their home parish,” Hopkins said. He recently stepped away from seminary to be with his family and was looking for another opportunity to serve. Hopkins bleeds purple. He received his bachelor’s degree and a master’s in business administration from TCU, and both his parents are TCU grads and big supporters of Horned Frog athletics. Even when life takes an unexpected turn, “God has a plan for us and wants to bless us more than we know how to be blessed,” he said. Whether they are serving, worshiping, socializing, or learning, the ministry is designed to help students discover God’s plan for their lives. The TCU Catholic Campus Ministry is located on 2704 West Berry Street, just south of campus. 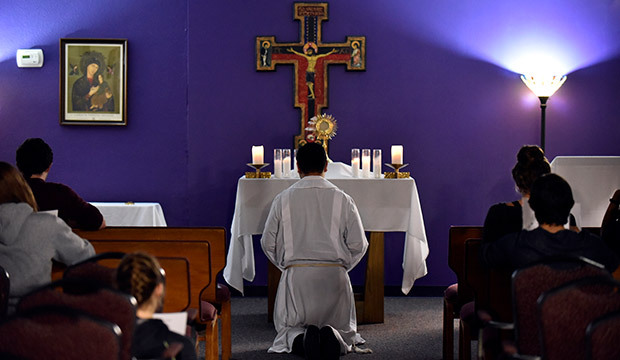 The space includes an office, a large room for several dozen people to attend Wednesday Mass or hang out between classes, a kitchen, and an Adoration Chapel for prayer and reconciliation. The facility is open Monday through Friday. For more information and to learn how to partner with the ministry, visit tcucatholic.org.